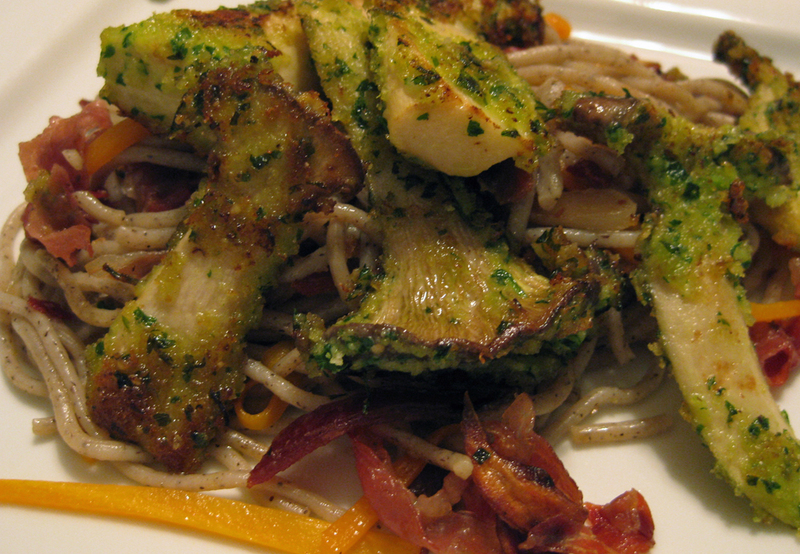 Soba noodles, mushrooms, prosciutto and carrots. Buckwheat soba noodles are a terrific departure from the standard semolina pasta most of us have on hand. These Japanese noodles are relatively easy to find in your local markets. They’re nutritious, fast cooking and good hot or cold. We love them in soup and in salads. Their nutty flavor pairs equally well with ingredients from the east and west. In this version, the noodles are treated like Italian pasta, perfect with prosciutto, Parmesan cheese, garlic and olive oil. The epicurious.com version of this recipe includes a fried egg atop each serving of noodles. We eat mushrooms regularly, but we rarely stray from the very common white button or brown crimini mushrooms so readily available in every market. It’s a shame given how easy it is to find exotic “wild” mushrooms in these parts. We’re mesmerized by the variety available at Far West Fungi’s Ferry Building Marketplace stand (visit their website to get the low down on your favorite fungus). The trumpet mushrooms used here in place of the fried egg came from the 22nd and Irving produce market in our neighborhood. I happened upon them on my way to the checkout counter and couldn’t resist their beauty. They were unblemished and seemed to be begging to go home with me. I saw this impulse buy as an opportunity to experiment with a mushroom variety that seems to be increasingly available in the market and on menus everywhere. I can’t take credit for the idea to lightly batter and pan fry these mushrooms, so all due credit to Cook Almost Anything guest blogger Huan who does a terrific job of describing the pan-fried mushroom dish. Huan gives inspiration credit to the good folks of Church Street Enoteca in Sydney. Breading and pan-frying mushrooms can’t possibly be “new” but this beautiful preparation was certainly new to us. Like so many spur-of-the-moment weeknight dishes, what follows is a simple improvisation that combines two of our favorite foods. Give it a try and make it your own! Beat the egg with the milk in a shallow, flat-bottomed bowl and set aside. Combine breadcrumbs and parsley in the bowl of a small food processor and process until parsley and crumbs are just blended. Add the grated cheese and process again just until well mixed. Turn the breadcrumb mixture out onto a plate and set aside. Cut the mushrooms lengthwise into 1/8 to 1/4 inch thick slices. Place the mushroom slices into the egg mixture and coat well. Shake off excess egg and dredge or coat the slices in the breadcrumb mixture and set on a clean plate or baking sheet in a single layer. The crumbed slices can be stored in the refrigerator, covered, for several hours. To cook, heat oil and butter in a non-stick skilled over medium high. Working quickly and in batches, cook the mushroom slices for two or three minutes on each side or until they’re a golden brown. Remove them from the pan and set them on paper towels to remove any excess oil. If you’re enjoying these mushrooms as a side dish on their own, grate additional cheese over them while still hot and serve with your favorite dipping sauce. Cook soba noodles as suggested on the packaging. Reserve 1 cup of cooking liquid, drain noodles and rinse with cool water to stop the cooking. Drain and set aside. In a large, non-stick skillet, heat 2 tablespoons of the olive oil over medium-high heat. Add garlic and stir, cooking just until fragrant. Add prosciutto strips and cook until slightly crisp. Remove and set aside on paper towels to drain. Return non-stick skillet to the heat and add 1 tablespoon of the olive oil. Add carrots and cook just until they start to get a little bit of a sear. Add noodles and a tablespoon of the reserved cooking liquid to deglaze the pan and steam the carrots a bit. Add prosciutto and garlic to the noodles and cook over medium heat until heated through. Remove the skillet from the heat and add the grated cheese and the remaining tablespoon of olive oil and toss to coat. Plate and serve topped with the herb-crusted trumpet mushrooms and a sprinkle of cheese. Serve it hot!